Open mic night was a huge success. With a roster of twelve different acts, the night was anything but a bore. The lights were dim, and the room was packed as Isaac Sanders kicked us off with his guitar and harmonica skills. A constant crowd pleaser, the trio of Ryan Hannay, Brad Baker and Jake Dickerson performed many times during the night, bringing us the songs Blank Space, Bad Romance and Rivers and Roads as a tribute to SNU seniors. Bad romance got especially personal as Bradley Baker added his own personal flare to the song. Audience members and SGA officials agree the night was good. While pop songs and guitar solos were the main attraction, spoken word made a few appearances through Seth Shepard and Davante Owens. Davante gave us a dramatic reading of “I’m not afraid to die”, while Seth taught us that Pluto is still a planet, and floss can be the object of a passionate affair. Jana Seymour and Mandie Oliver brought things back to basics with their musical ukulele stylings. Amy Lauver reminded us what it was to be a kid again with her dramatic reading of Shel Silverstein’s The Unicorn. Saturday Night Live fans will be happy to know that they were represented through Danny Smith and Mady Martin’s portrayal of the popular characters Garth and Kat. As time led on, the Pop’s dining area seemed to turn into a downtown coffee lounge or a slam poetry parlor, as some began to snap in appreciation rather than clap. There were groups from all over campus in attendance. “SGA did a very good and tasteful job with this event,” said Noah McGuire. Ryan Hannay remarked that the event was very easy to set up, and due to the success of this one, there will be another open mic night in about two months to raise funds for the Water4 program spoken about in chapel. 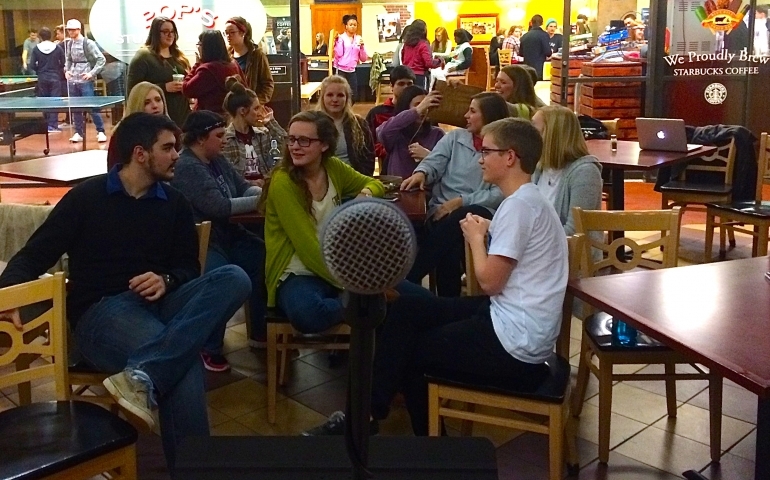 From the reactions seen at this event, there is no doubt a second open mic night would be even better. The people in attendance were eager to attend the next event. A banquet of refreshments was provided for anyone present. The atmosphere proved joyful as each act was applauded even more than the last. All in all, it was a sight to behold so if you were unable to be there this time, make sure you see the next one.